I’ve always been one of a small percentage of the population in Los Angeles who wakes up early in the morning. So naturally, breakfast (and an early brunch) is my favorite meal of the day. For the past couple months or so, I’ve been trying different places around the Los Angeles area for breakfast. One morning, I drove to Venice Beach to a bakery & deli called Gjusta to check out their morning breakfast. A male customer and I were the first inside just as they opened the doors in the morning. We struck up a delightful conversation about bread, then he tells me that he’s an architect who knows a lot about the building where Gjusta is located. The building is very old and was vacant for decades until it transformed into the bakery and cafe that it is today. The infrastructure had not changed much, which he thinks is the very reason why the conditions inside are ideal for baking bread. Anyway, we both shared the same idea of buying great bread and freezing it for later consumption. He left with eight loaves of bread to stock at home and some pastries to give as food gifts to his clients. I, on the other hand, stayed for the breakfast. The guy at the counter kindly gave me the scoop on how to order. He says that my early morning arrival was perfect, because it makes ordering for food painstakingly easy when there are hardly any customers. However, by 9:00AM, the bakery is packed and placing an order requires that you take a ticket and wait for your number to be called. He then pointed to the ticket dispenser behind me. 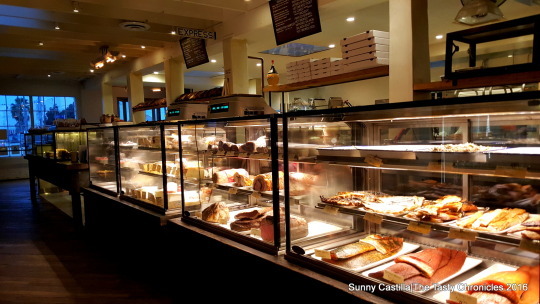 Each station is a specialty area like ordering coffee is there, ordering quiches and salads is there, bread and pastries is over there, sandwiches, meats, and cheese is here. Listen for your number and order what you want from whoever is helping you. He or she will follow you to each station. I’ll be the first to admit that it was a bit overwhelming to place an order, because there was a lot of great selections from both the display cases and what was listed on the menu boards. The variety of food is endless and the assortment bread is irresistible. I really could have placed an À la carte order a Sprouted Rye loaf of bread, a jar of Chicken Liver Pate, a thing of Compound Butter, a fried egg, and a small jar of Pickled Carrots and just called it my breakfast order. Or I could have ordered a small portion of their various Smoked Fish and fresh baked Bialy. There were so many wonderful food items to just call breakfast, but I made things simple by ordering from the menu board instead. Since it was a brisk morning in Venice Beach, I was in the mood for some hot food to eat, so I placed an order of Baked Eggs and the Anchovy Toast, which looked like a good combination for a hearty meal. I also ordered a Cappuccino and a Grapefruit Panna Cotta as my breakfast dessert. I paid, took my order number for my table, and whisked over to the coffee station to pick up my drink. Of all things. the only place to sit down and eat at Gjusta is in the outdoor patio area. It’s a quaint space with weather beaten wooden dining tables and plenty of room for a baby stroller or a dog or perhaps a dog in a stroller. While I didn’t mind sitting outside to eat, I did mind the chilly air and had one of the guys turn on a patio heater for better comfort. Within minutes, my food was delivered to the table. The Baked Eggs was a simple pleasure to eat. 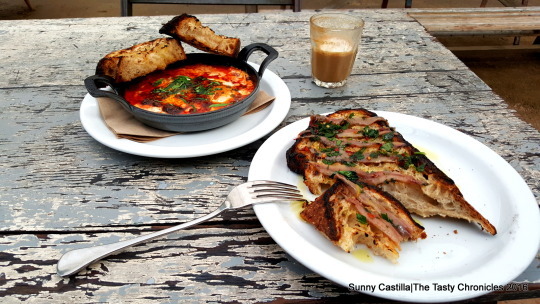 I adore eggs dishes and Gjusta’s Baked Eggs were perfectly concocted with a divinely tomatoey Chermoula sauce. 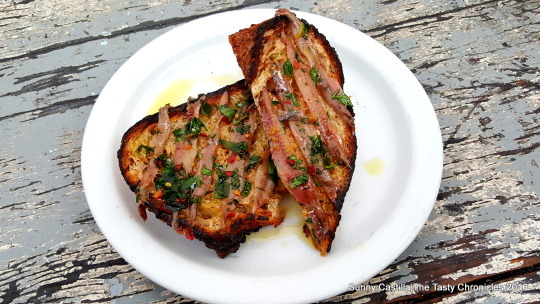 The Anchovy Toast was unknowingly more rich and savory yet delicious through and through. This huge cut of rustic Sourdough Bread is grilled and then intricately lined with salt-cured anchovy and doused with good dose of olive oil. Gjusta doesn’t skimp on the bread. It’s a sizable portion with a good texture, soft and chewy inside yet with this uber crusty outer shell to knaw on. My first bite of this toast was like gasping for air. My entire mouth was coated with anchovy goodness, but I was sort of stuck there in mid-bite thinking that I should have gotten some fizzy water to cleanse my palate. What helped was dipping ripped portions of the Anchovy Toast into the tomatoey sauce. It did the trick to offset the richness. 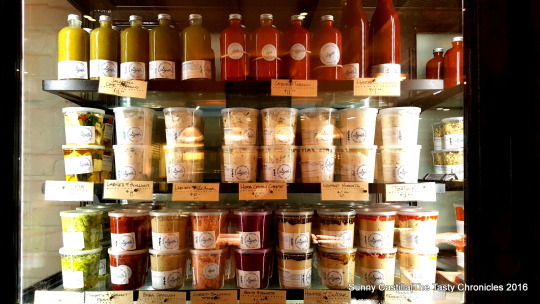 After having one of the best breakfasts that I’ve had in a long time, gourmet food shopping at Gjusta beckoned me. 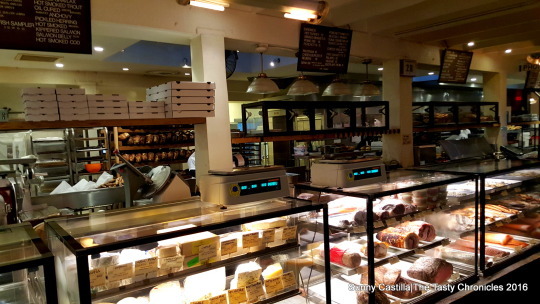 There is a lot of great selections of handcrafted, artisan pastries, bread, deli meats, smoked fish, cheeses, pickled and fermented vegetables, jams, and compound butters. Most items are prepackaged and ready to grab and go. The portion sizes are about right for the price too. I picked up some Compound Butter, a wedge of Vermont Cheese, Smoked Salmon Spread, Rhubarb Jam, a Sprouted Rye Bread, and some Croissants instead of the French Baguettes that I so desperately desired. Unfortunately, the baguettes were not available until after 9:00AM. Of all things, how could they deprive me from a fresh baked French Baguette in the early morning? 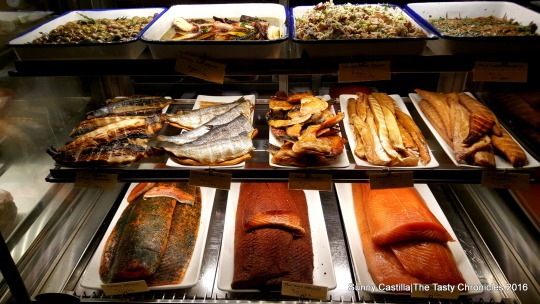 Bakery, Deli, and Gourmet Market, $$, Breakfast, Brunch, Lunch, and Dinner. Credit cards accepted, no alcohol, limited parking lot, and plenty of street parking. No reservations, counter-style ordering with first-come, first-served patio dining area.